Clive Woodward - Rugby Coach & Leadership Speaker. 2003 England World Cup Winning Team Head Coach, Team GB Director of Sport (2006 – 2012) and leadership speaker. 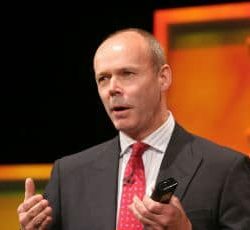 Clive Woodward is one of the most sought-after leadership speakers in the industry. Drawing on his experience in both business and sport, he delivers inspiring and thought-provoking keynotes about performance enhancement, leadership, and teamwork. In 2006 Clive joined the British Olympic Association. As Team GB’s Director of Sport where he worked in close partnership with key stakeholders in British Sport to support the national coaches and athletes at the Beijing & Vancouver Olympics as well as deliver Team GB’s most successful Olympic Games in the modern era at London 2012. Clive remains committed to supporting the development of coaches and athletes today through his position on the IOC Entourage Commision and he is also the Founding Partner and Chairman of Captured – an online coaching software and synchronised app based on his coaching philosophy currently being adopted by The FA, The PGA and The IOC. The app. reflects the importance Clive places on empowering individuals to take responsibility for their own learning by capturing and sharing knowledge to achieve high performance. Clive’s acute understanding of the synergy between business and sport has cemented his reputation as a renowned and thought-provoking speaker. He and his team aim to inspire audiences and equip them with practical and applicable tools and knowledge. Clive also works within organisations to utilise his approach in delivering better performance through workshops, masterclasses, executive coaching and digital learning. As a speaker, Clive delivers thought-provoking, challenging and entertaining keynotes tailored to each organisations’ requirements, drawing on his experience as a businessman, athlete and coach. How to get a winning mindset.